From the big barn that has stood as an icon in the heart of Peconic for 100 years, comes Ackerly Pond Vineyards. Named after a pond a mile to the east that was the site of a grist mill, Ackerly Pond Vineyards was established seven years ago by Ray Blum who has been growing grapes and producing fine wine on the North Fork for twenty-eight years. Ray was one of the first to envision the North Fork of Long Island becoming a thriving vineyard region capable of producing some of New York State’s finest wines. A retired FAA air traffic controller, Ray and his wife, Jill, a retired microbiologist, devote their full attention to growing their own grapes on eighty-five acres of prime farmland in Southold and Peconic. Harvest starts only when the sugar and acid levels have reached their optimum values, which will be late September through October. The tasting room is open on the weekends and holidays. 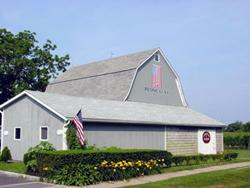 Just look for the big gray barn with the American Flag on Peconic Lane.